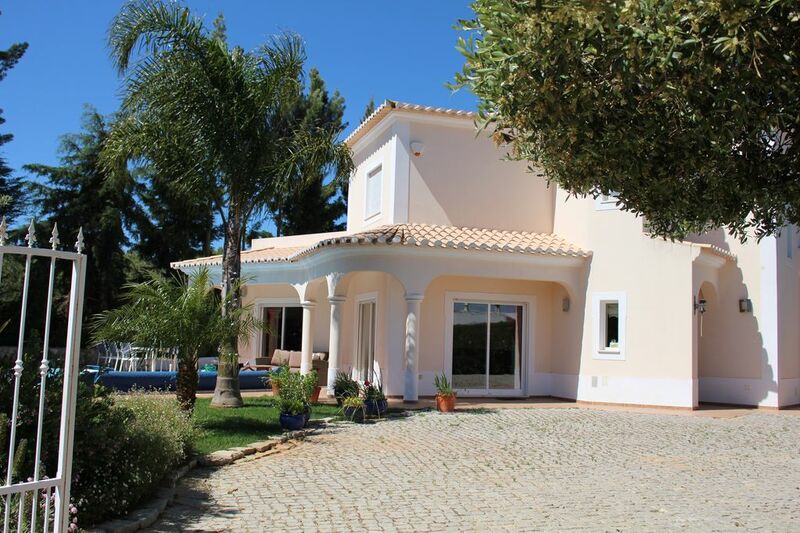 This modern villa is set at the end of a cul-de-sac in only 5 mins drive from the centre of Carvoeiro (20 min walk) . With it's large fully equipped kitchen, lounge and dining areas, outside terraces, large bedroom terrace plus roof terrace it is ideal for those who seek a peaceful holiday yet with easy access to the many attractions of Carvoeiro and the Algarve. There are extensive rural views to both the south over a extensive pine plantation and north (Monchique hills). 3 ensuite bedrooms with Aircon, Wi-Fi, UK TV , cable Tv. Fully fenced and gated garden. Parking for up to 3 vehicles. A short drive from local supermarkets and a number of restaurants within walking distance. We are a semi retired couple who hope to make Portugal our permanent home in the future. Our villa is a home and we have included many additional features that you will not find in a commercial rental property. We aim to be flexible with dates arrival times any special requirements etc as we know how important this can be when you are making your holiday decisions. We decided on Carvoeiro because it still has that feel of a small village and has an established permanent population . As golfers we are spoilt for choice , as a fisherman I can walk to a local beach where I have on the odd rare occasion caught dinner. As keen walkers there are miles of clifftop and beach walks in the area. Sometimes the only sounds we hear the local birdlife and the neighbours chickens . Bedroom 1 en-suite bath with shower and wc. Bedroom 2 en-suite shower and wc. Bedroom 3 en-suite bath with shower, wc and bidet. 3 seater, 2 seater sofa plus. Garden with lawn and flowerbeds. fully enclosed. Entrance gate lockable. Notes on accommodation: Safe, burglar alarm Outside: Entrance to the villa is through double gates onto a large paved driveway. The 8 x 4m (1.3-2.5m deep approx) pool has all round terraces. The attractive gardens are a combination of established trees, olive and almond (not edible) plus new planting of lime, peach and pomegranate. The attractive garden which includes a small lawn area, is a particular feature of this villa. Views to the south are over an extensive pine plantation. There is a BBQ plus loungers and outdoor tables and chairs. The design of this villa allows you to find shade or sun throughout the year. Views to the North towards Monchique. Utility Room: Washing machine. Fridge. Cleaning / Towels / Linen / Maid service: All towels and lined provided (duvets when needed). Mid week towel and weekly linen change. Cleaned prior to arrival. Other: Comfortable outdoor furniture on both pool terrace and bedroom terrace. superb villa,better than we could have imagined. where do I start,the property was a dream to stay at.we loved oiur short stay at this villa.everything is catered for and its like home from home.we would move and live there tomorrow.lovely and clean and looked after by various local people to make sure you have a great time.just far enough away to be quiet but an easy walk of twenty mins into town for a great night out.pool is warm and clean and a great place to spend your days.we will be back soon. Very nice villa ,modern, clean & very relaxing, only slight problem which got sorted was pool heating not quite hot enough for our taste. Overall brilliant stay. Beautiful and spacious villa, perfect for a family holiday. My family and I stayed at the villa during August 2017. The villa was beautiful and spacious with wonderful rooms and a fantastic terrace. It's quite a challenge taking four young boys on holiday, but the villa was so well equipped, it made things a lot easier for my husband and I. The large kitchen has everything you would need in addition to further useful things like an iron and ironing board, hair dryers, washing machine and dryer. The pool and various seating areas are wonderful and provide a relaxing and spacious home during your holiday. The location is perfect as it is close to Carveiro, Ferragudo, Albufeira, Slide and Splash Water Park and Silves. Terry and Liz are extremely helpful owners and ensured that we received lots of information beforehand. We would love to return to this lovely villa. My family and I enjoyed staying at Mr. and Mrs. Ross' Vila very much. We stayed from July 7 to the 14, 2017 and had a wonderful time. We specially enjoyed the heated pool as the weather was a bit cool somedays. The Vila is well located to access a number of great beaches and restaurants. I couldn't be happier with this choice. Thank you Mr. and Mrs. Ross for allowing us to use your lovely home. Be prepared to move around to catch the sun, trees soon shade the pool. The villa is in an urbanisation where most people seem to have at least one dog, most of which bark at night, and whilst it wasn't an unpleasant sound, be prepared for the local roosters. There were also two cats that 'hung about' round the garden and, having left the french window open one morning, I found one upstairs in our room. Not good as I have an allergy to cats. The worst thing about the villa was the mattress in the main bedroom, it was the worst I have ever slept upon or rather, couldn't sleep upon. There was everything in the villa that you might need other than decent glasses, we bought two for us to use whilst we were there because we didn't like using the plastic ones provided. Very cheap from Intermarche nearby. The owners seemed very nice and were helpful when the alarm would not turn off, Marilde came across the following day and changed the battery which seemed to have been the problem. Electric shutters were convenient and two fridges were useful. It did seem strange to have cupboards and drawers sellotaped up throughout the villa as well as locked doors, it felt a little like being in someone elses house without permission. I know that the owners treat it as a second home but we've stayed in many villas where this is the case and owners have usually had one locked area for their personal things. In the description it did say that towels were provided but when we arrived we discovered that the visitors information book said that pool towels were not provided. I try to ask questions prior to renting villas to ensure that we are hiring the one most suitable for our holiday. Overall this is a nice place but we could have found somewhere more suitable if our questions had been answered a little more honestly. That is why I have written this review. The reviewer stayed in the autumn when in the late afternoon the trees on neighbouring land do shade the pool. This is not the case in summer and some have been removed. There are a few points to correct. We do provide beach towels but ask guests not to use those for the bathrooms. The plastic glasses for pool use are certainly not cheap or from Intermarche. We ask guests not to put them in the dishwasher as this causes them to discolour. There is a new thicker topper on the king size bed in the main bedroom..
Our villa is not on a commercial development so guests will experience the sounds of life in Portugal . We do shut up some cupboards as these will contain our personal possesiond. Our villa is also a home not just a commercial rental. Guests who book for this summer will find additional outside seating , new sun loungers, upgrades in the kitchen and downstairs bathrooms.. The trees the guest referred to have now been removed from the villa boundary. villa parfaite superbe piscine nous avons adorés sejourner a carvoeiro , villa bien placée , plages à proximité sont tops , communication avec les propriétaires parfaite, bref superbe à tous les points de vue . The Carvoeiro area is famous for it's limestone cliffs and many coves and beaches. The town beach is less than 5 mins drive (20 mins walk) with many others in either direction east or west. For families the sheltered Pria Grande in nearby Ferragudo, has a safe shallow beach within the river Arade estuary. This and the nearby resort of Praia da Rocha are also the locaton of many water sports activities. Faro airport 1hr drive. Car hire highly recommended if you are to make the most of your holiday. Carvoeiro 2km, Lagoa 3km, Ferragudo 5km, Portimao 10km. Hypermarket at Portimao AQUA Shopping centre (15 mins drive ). Village shops, banks and local supermarkets 5 mins drive 15 min walk. Wider variety of shops in Lagoa. Lagos and Cape St Vincent 1hour. Slide and Splash Water Park 10 mins drive. Zoo marine 15 mins drive. Monchique Hills 20 mins. Silves (historical centre of Algarve) 15 mins drive. WI FI access is vailable in some of the bars in Carvoeiro and in areas such as the main square in nearby Silves. The new F1 std race track at Portimao offers driving experience days.